This lecture will highlight a brand new chemical bond, often called the mechanical bond, and the contribution that its introduction into molecules that constitute chemical compounds is making to the construction of nanoscale entities. Many of these entities turn out to be intellectually stimulating and visually captivating topological forms – and works of art with in their own right. Many incorporate function along with structural form and are finding their way, through the fabrication of integrated systems, into molecular electronic devices and drug delivery systems. Indeed, anoelectromechanical systems in the shape of artificial molecular switches have become commonplace. The grand challenge confronting molecular nanotechnologists today – similar in many ways to that faced by the early aviators of just over a century ago – is to make the daring leap from switches to the machines of tomorrow, inspired by the fact that we ourselves operate in large measure under the exquisite control of sophisticated molecular machinery. 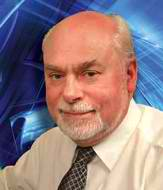 J. FRASER STODDART is Trustees Professor of Chemistry and Director of the Center for the Chemistry of Integrated Systems at Northwestern University, and World University Professor at the Korea Advanced Institute for Science and Technology. He is widely known for creating the mechanical bond and for developing a new field of chemistry to explore and develop novel molecules held together by topological constraints. Among many other accomplishments in this field, he synthesized the first two-state mechanically interlocked molecules (MIMs): bistable catenanes and rotaxanes that can be switched from one state to the other and back. He utilized these bistable MIMs to make artificial molecular switches (AMSs), and used the AMSs to fabricate molecular electronic devices (MEDs) and nanoelectromechanical systems (NEMS), forming the foundation for complex molecular-scale electronic devices and electro-mechanical systems. Currently he and his research group are developing ways to couple these molecules and systems into hierarchical assemblies that can perform significant work at the nano-, micro- and macroscopic levels. The work has the potential for revolutionary advances in machine efficiencies and computational densities (among others). Sir Fraser has authored over 950 publications, many of them seminal, and he has given over 1,000 invited lectures. Most importantly, from his point of view, he has mentored more than 400 graduate students and postdoctoral fellows during more than four decades as professor, scholar and researcher in chemistry. To his great delight and deep satisfaction many of them are now successfully engaged in research careers of their own, drawing on the inspiration they found in his research group and passing it on to their own students and colleagues. He has received many awards and prizes for his work and service including the: Izatt-Christensen Award, ACS Cope Award, Nagoya Gold Medal, King Faisal International Prize in Science, Tetrahedron Creativity Prize, Albert Einstein World Award in Science, Foresight Feynman Prize in Experimental Nanotechnology and the Royal Society Davy Medal. He was Knighted by Queen Elizabeth II for his service to science and received a Royal Medal from the Duke of Edinburgh. He is a Fellow of the Royal Societies of London and Edinburgh, German Academy of Natural Sciences, American Association for the Advancement of Science, and the Royal Netherlands Academy of Arts and Sciences. He has received honorary doctorates from Birmingham University, University of Twente, Sheffield University, Trinity College Dublin and the University of St. Andrews. He serves on many national and international advisory and review boards, including those of Angewandte Chemie and the Journal of Organic Chemistry. He travels widely and is an advisor to many institutions both public and private. Sir Fraser received his BSc, PhD and DSc degrees from Edinburgh University. He was an NRC Fellow at Queen’s University Canada, an ICI Research Fellow and then Lecturer at Sheffield University, and was Head of Chemistry at Birmingham University. He was Saul Winstein Professor of Chemistry and then Fred Kavil Professor and Director of the California NanoSystems Institute at UCLA before joining the faculty at Northwestern. President John Ingersoll called the 2,294th meeting to order at 8:37 pm January 6, 2012 in the Powell Auditorium of the Cosmos Club. Mr. Ingersoll announced the order of business and thanked Millen, White, Zelano & Branigan, PC for their sponsorship of the meeting's lecture. The minutes of the 2,293rd meeting and the 2011 Annual Meeting were read and approved. Mr. Ingersoll then introduced the speaker, Mr. J. Fraser Stoddart of Northwestern University. Mr. Stoddart spoke on "The Beauty and Promise of Molecular Nanotechnology." Mr. Stoddart began by discussing his lifelong interest in the field of chemistry, which he believes, amongst all the sciences, appeals most to human creativity and offers the greatest opportunity to dabble in art. He continued by describing Platonic solids and the chemical aesthetics of pigments and crystals. Molecular nanotechnology brings a new style of beauty to chemistry in the form of miniaturization, he said. He then described two molecular structures known as mechanically interlocked molecules (MIM). A Catenane consists of two or more interlocked ring-like macrocycles and a Rotaxane is a dumbbell-shaped component threaded through one or more macrocycles. This interlocking is called a "mechanical bond," since no direct covalent bond exists between components. He continued by describing more topologically complex structures like the trefoil knot and the Borromean Link. The Borromean Link consists of three interlocking rings and is named after the Borromeo family, due to its presence on their family crest. Mr. Stoddart illustrated that similar interlocking structures can be found in art and design across many cultures and throughout history. Mr. Stoddart then explained how difficult it is to construct molecular Borromean rings by adding each ring in series. He described how, using an eighteen component self-assembly process including six metal ions, the entire structure could be created at once. Mr. Stoddart also described how a change of solvent can cause the self-assembly process to instead create a two-ring structure called a Solomon Knot, which is also widely found in historical and modern art. Mr. Stoddart demonstrated how a bistable Catenane could be used as a molecular switch. This development led to a more sophisticated switch using a Rotaxane that produced better distinction between states. When deposited on an addressable grid, these switches could be used a molecular memory and Mr. Stoddart noted that a 160 Kbit prototype device would fit inside a single white blood cell. Mr. Stoddart discussed various applications for molecular switches, such as encasing anti-tumor drugs in a selective delivery vehicle. This mechanized silica nanoparticle (MSNP) would enable treatments to target only the tumor and avoid exposing nearby healthy tissue. This technology is currently under development, but true artificial molecular machines are still a grand challenge, he said. He concluded by discussing how cyclodextrin can be used as a molecular container. A surprisingly simple chemical process involving mainly sugar, salt, and alcohol can produce a cage of interlocked cyclodextrins called a metal organic framework (MOF). This food-grade MOF is safe, cheap, easily made, and could be applied to problems such as detecting and preventing food spoilage, delivering chemicals in personal care products such as toothpastes and deodorants, or in home care products such as air fresheners and HVAC filtration. After the question and answer period, Mr. Ingersoll thanked the speaker, made the usual housekeeping announcements, and invited guests to apply for membership. At 10:17 pm, President John Ingersoll adjourned the 2,294th meeting to the social hour.